A Summary Of Why The Global Annual-Average Surface Temperature Is A Poor Metric To Diagnose Global Warming | Climate Science: Roger Pielke Sr. The use of a global average surface temperature trend as a diagnostic to monitor global warming is, at best a crude approach, and at worst an erroneous tool for that purpose. This post summarizes why. A graph of the global components is shown in Figure 4 . It shows that the rate of ocean storage is in close agreement with the net radiation flux except for the months of January and February. (This disagreement may be due in large part to possible errors in southern hemisphere ocean data). The annual variation in the earth’s net radiation balance may largely be accounted for by considering the effects which the present day earth-sun geometry and the asymmetrical distribution of continents between the northern and southern hemispheres have on the net radiation balance. The orbit of the earth about the sun is such that the earth is closest to the sun in January and farthest from the sun in July. This creates an annual 11.2 W per meter squared amplitude variation in the solar flux received by the planet earth. This variation is a purely external driving mechanisms, since it depends only on earth-sun geometry. When a value of 30.4% (Table 2) for annual mean global albedo is used, the annual 11.2 W per meter squared amplitude variation of incoming solar flux translates into an approximate 7 .8 W per meter squared variation in absorbed solar flux at the top of the atmosphere. Atmospheric data show an annual cycle in the global average near-surface temperature with an amplitude of 2C [Van Loon,1972]. Maximum and minimum values are found in July and January, respectively. This temperature variation may be interpreted as an amplitude variation of 7 W per m squared in the long-wave flux emission to space if typical atmospheric emissions are considered and all temporal variations in the intervening atmosphere are ignored [Ellis,1977]. This effect in the long-wave flux combines with the effect in the absorbed flux to give a 15 W per meter squared amplitude variation in the annual net radiation balance profile. The global ocean can maintain equilibrium by an average change in its heat content between times of maximum storage and maximum release of less than 1C over a 50-m-thick layer. 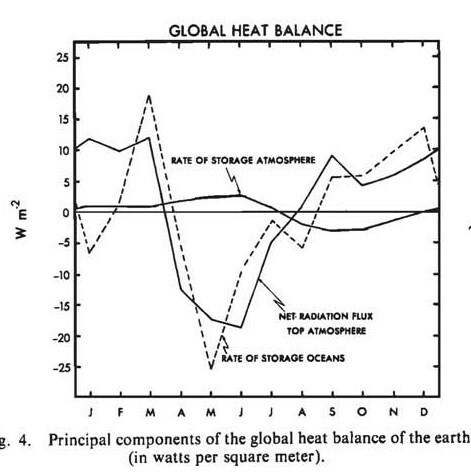 Unfortunately, instead of basing a global warming analysis on the framework such as in the Ellis et al 1978 paper, the long-term annual-averaged, global surface temperature trend is typically used as the icon to describe global warming (e.g. see). The value of +2C is often presented as a threshold beyond which major climate disruption will occur (e.g. see). A final comment on this paper, if heat really is deposited deep into the ocean (i.e. Joules of heat) it will dispersed through the ocean at these depths and unlikely to be transferred back to the surface on short time periods, but only leak back upwards if at all. The deep ocean would be a long-term damper of global warming, that has not been adequately discussed in the climate science community. The world ocean accounts for approximately 90% of the warming of the earth system that has occurred since 1955. One third of the observed warming occurs in the 700-2000 m layer of the ocean. Using a global annual-averaged surface temperature trend is only a small part of the analysis used to create figure 4 in Ellis et al. Their framework requires the absolute value of temperatures both spatially and temporally in order to construct a global annual-average surface long wave emission. Seeking to diagnose the magnitude of global warming (as represented by an annual average global radiative imbalance of the ocean-land-atmosphere using a global average surface (~2m) temperature trend) is fundamentally flawed. If ~90% of the heating is in the oceans, what is the value of diagnosing global warming using the land portion of the surface temperature record even if it did not have a warm systematic associated with the minimum temperatures as we have reported on. The annual variation in the radiative imbalance is on the order of 3o Watts per meter squared. Diagnosing a multi-decadal chane in its mean annual value to the order of tenths of a Watt per meter squared is hard enough using long-term annual-averaged changes in ocean heat storage change. Trying to do this with the surface temperatures in values of tenths of a degree C, even up to 2C, with its large spatial and temporal variations, is an even more difficult task. My recommendation to the climate community is that an updated version of the figure at the top of this post be presented for as many years as possible. With the new data, such as the more robust Argo data and satellite monitoring of tropospheric temperatures and top of the atmosphere radiative fluxes, this should become the gold standard of monitoring global warming. The use of the global annual-averaged surface temperature trends for this purpose would be relegated to where it deserves to be – an historical relic.